"Ned Beg" and "Joe Bill Joe"
Who were they, what did they do and how did they get their nick-names? Few words byway of background may help set the scene for these two remarkable characters. Both in their own way larger than life and who had they been born in Brisbane or Birmingham rather than the Isle of Man would still have emerged as leaders of their community and successful business men. "There is no doubt that in addition to the immediate turmoil caused by the abolition of the smuggling traffic, the passing of the Mischief and Revesting Acts by the British parliament had various depressing effects on the economy of the Island, so that poverty was widespread, prices increased rapidly, and many people were forced to emigrate to obtain a livelihood. Naturally the difficulties were heightened by particular events such as the tithe disputes and potato riots of the 1820s…" It was into this background that our two characters were born. To distinguish between various members of society, particularly those with the same surname, and more often than not exactly the same christian name, it was necessary to devise some means of ready identification. Thus nicknames were common in the Isle of Man, but unlike the greater part of Teutonic and Latin Europe these nicknames never developed into surnames. Patronymics had too strong a hold on Celtic Mann to be easily ousted by nicknames. It often happened, however, that a man was better known in his own immediate neighbourhood by his nickname rather than by his correct name. Nicknames could be derived from the character or appearance of the person, or their place of abode or parents’ Christian names or the trade or occupation. One famous Manxman is known as ‘Illiam Dhone,’ meaning Brown-haired William. In our case, therefore, ‘Ned Beg,’ means little or small Edward and ‘Joe Bill Joe’ means Joseph the son of William the son of Joseph. What of the characters themselves? Let us firstly look at "Ned Beg." He was the son of John Qualtrough and Elizabeth Gorry and we know he was baptised in the Parish of Kirk Rushen in the Isle of Man on the 10th October 1824. The first official record we have of him appears in the 1841 census, where we discover that he was aged 16 and living with his father John and stepmother Margaret in the Cumberland Inn in Port St. Mary. John was the publican at that Inn. By the time of the 1851 census Edward, then aged 26, had married Eleanor Quayle and was described as a Grocer/Spirit Merchant. The marriage had taken place at Kirk Patrick on the 23rd April 1846. You may say nothing remarkable about that - yet let us stop for a moment and consider what it really means. Because of the difficulties of travel, no trains, no public transport and unmade roads to undertake any journey in the 1840’s was at best difficult if not impossible, except by sea. Where Eleanor came from was on the West coast of the Island and this was separated from the South, when Edward lived, by the spine of hills that run North/South through the Island. It was, therefore, the norm, at that time, for people to marry a spouse from their own small locality, people who lived within a few miles of each other. This was not the case with our "Ned Beg," his wife came from what could have been a different land! The next interesting fact to emerge is to look at the baptism of his eldest son William Edward Qualtrough. William Edward was baptised in the Parish Church where his parents were married, namely Kirk Patrick on the 15th December 1850. Again nothing remarkable in that fact, indeed quite a normal practice. What is remarkable is the fact that this son was born in the United States of America! So clearly we know that "Ned Beg" was a traveller, and most unusually at that time, prepared to travel to the USA, and then a few years later to return home. On his return he established his own business, a business that was to grow and prosper. In later years ‘Ned Beg’ expanded his business and became a net manufacturer. It must be remembered that until well into the nineteenth century nets were made at home. These home-made nets of wool, hemp or linen were made in winter evenings. One eye witness report says, "Each person in the household had his allotted task in the home net-making; none was idle. The thread of which the ‘jeebin’ was made was from hemp grown in the homestead. The hemp being put on the ‘quiggal’ (stick holding the bunch of hemp for spinning) and spun by the women into thread; the old men and women threaded the needles or shuttles; the men with the needles netted the thread into ‘jeebins.’ A smart man could make a ‘jeebin’ of net in a day, and the slowest worker could average from three to four yards of an evening." Machine made cotton nets were introduced after 1854 and these nets replaced the old linen nets. It was these new-fangled net making machines that Ned Beg introduced into his factory in Port St. Mary and turned a home craft into an industry. Great lengths of net were required since a typical fishing boat’s set of nets, or ‘train’, in the late nineteenth century consisted of a vertical wall over a mile long and eight metres deep! A Manx Nickey, with Peel Castle in the background. Now let us turn to "Joe Bill Joe". He was the middle son of three born to Margaret Daugherty and William Qualtrough, and like "Ned Beg" he was baptised in the Parish of Rushen, his baptism taking place on the 24th August 1823. Looking at the 1841 census we find "Joe Bill Joe," then an apprentice carpenter living with his widowed father at the family farm at Glendown, in the Parish of Rushen. By 1851 "Joe Bill Joe" had married Isabella Keggin and was living in the Qualtrough House in Port St. Mary. His occupation was described as being that of a carpenter. Joe Bill Joe’s wife was a local girl so it appears that Joseph was not the globe trotter Edward was. At some stage Joseph acquired the knowledge of ship design and art of ship-building, because he commenced and headed a business that not only built fishing boats for the manx sea fishing, but also trading schooners that traded world-wide. There is an apocryphal story told about Joe Bill Joe. It appears that he was with friends drinking at the George Hotel in Castletown when the press gang arrived and all the able-bodied young men, including Joe Bill Joe was pressed into the British Navy. Whilst most of his compatriots were reduced to a terrible state, fearful for their lives and livelihood it is reported that Joe Bill Joe was only troubled by that fact that he did not have a spare pair of clean socks with him! It is also told that whilst in the Navy Joseph’s skills as a shipbuilder was discovered and his days as a sailor before the mast were soon over and his skills were put to use redesigning ships for the Navy that were both faster and more efficient. 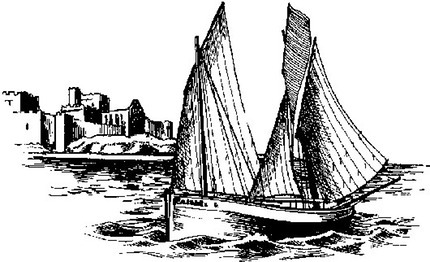 During the 1860’s a new design of fishing boat, from Cornwall became very popular. These boats were known as ‘Nickeys.’ Manx fishermen were impressed by the speed of these vessels and the design was adapted by boat builders like Joseph. In good conditions the newly designed boats could sail at speeds of 10 knots. This was a great improvement in speed and meant that a fishing vessel could sail from Port St. Mary to Kinsale in Ireland in 28 hours. Not only did Joseph build boats for local use, the Irish Government were most impressed by his vessels and he was asked to design and build a number of fishing boats for the newly established Irish mackerel fishing. 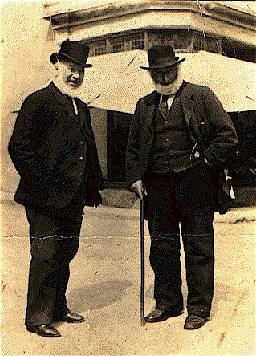 Whilst our photograph shows the meeting of two old gentlemen for an agreeable chat, it appears that it was not always sweetness and light between these two gents! Again there is an apocryphal story told that at some stage in their respective business careers they fell out! As a consequence when Joe Bill Joe was about to build a new warehouse for his ship building business he decided to build in on the seaward side of the Cumberland Inn, the property of Ned Beg. Not only did he build there, he built the warehouse to such a height that it completely blocked the formerly magnificent sea view from the Cumberland Inn. Whatever their quarrel, it is clear that in later life these two great characters had made up their differences and became important figures in the local community and much respected by all.